FluoRender is a publicly available interactive rendering tool for confocal microscopy data visualization developed by the Scientific Computing and Imaging Institute of the University of Utah. FluoRender combines the renderings of multi-channel volume data and polygon mesh data, where the properties of each dataset can be adjusted independently and quickly. The tool is designed to better visualize the fluorescent-stained confocal samples like this Bio-Art 2012 winning picture of a mouse limb. 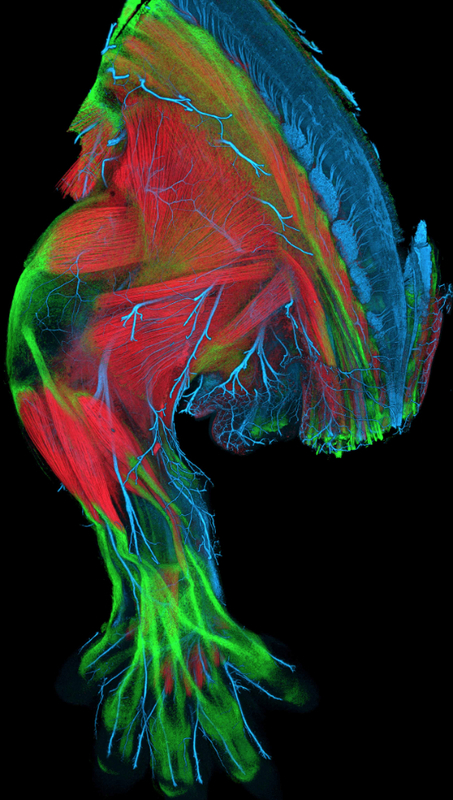 This picture of Kelsey Lewis and colleagues, is the limb of a transgenic, embryonic mouse, showing well established musculoskeletal and nervous systems. The limb is stained to have a detailed glimpse on muscles, tendons, bones, and nerves development. Other Bio-Art winning images available here. Bio-Art is organized by the Faseb Journal. of another cartilage reporter mouse.